Redesigned in Fall of 2018! This popular lightweight stock replacement starter now has a 1.7KW motor instead of the original 1.4KW. Staggered Mount for 168 tooth flywheels, stock replacement, Chevrolet Starter has a 12V, 1.7KW motor and a torque ratio of 10:1. 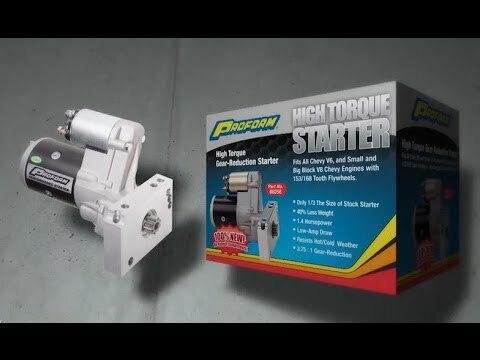 This PROFORM Starter is 100% NEW, not rebuilt with remanufactured parts! . Features full ball bearing construction. Fits Chevy Small Block and Big Block V8 Engines, as well as most V6 Engines.